Looking for an individual or team participating in this event? Welcome to our Team Fundraising Page! 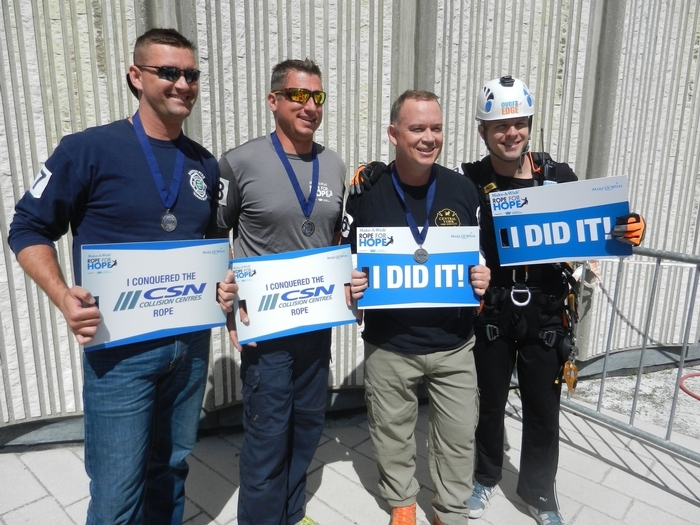 This year we are gathering our courage and teaming up in the Make-A-Wish® Rope for Hope, rappelling down from great heights, to help grant the wishes of children living with critical illnesses. A wish come true helps children feel stronger, more energetic, more willing and able to battle their critical illness. For many of them, it marks a turning point in their fight against their illnesses. You can help make a difference too! Your support of our team will allow the Foundation to continue to create powerful wish experiences, improving a child’s state of mind, replacing fear with happiness and helping them to feel like a normal kid again. To learn more about Make-A-Wish® please visit www.makeawish.ca. Every donation counts. Your commitment will help move Make-A-Wish® closer to their vision of granting the wish of every eligible child in communities across Canada. Please donate and support our team in Make-A-Wish Rope for Hope!